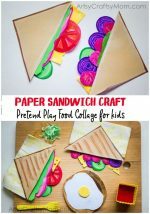 Set up your play food counter with a kiddie favorite – pizza, and make it super realistic with this incredibly detailed Paper Pizza Craft for Kids!! One of the best things about pretend play is that you can use your imagination to the fullest. A stick can be a wand, a scepter or a chef’s ladle, a rock can be a potato, a diamond or a mouse! The more detailed you make your props, the more ‘real’ pretend play becomes! That’s why we love making special crafts for pretend play, whether they’re quirky hats or animal crowns. And when it comes to food, we believe in going all the way! And if you’ve been following our recent posts, you know we’ve been busy cooking! Today, we’re adding a universal kiddie favorite to our pretend play food corner – pizza! This is one of those foods that can be customized any which way you like. We’ve made our paper pizza craft pretty loaded, and you’ll feel full after making it! 1. Every pizza recipe starts with the base, and so will our craft! A brown paper bag works best for this. Cut out a triangle with long sides so that the base of the triangle lines up with the bottom of the brown paper bag. Roll up the bottom part to get that stuffed-crust look. 2. Even if it isn’t exactly edible, we still like to keep things healthy! Cut out thin strips of green paper and fold them to look like bell pepper slices. Glue the ends together. 3. Let’s add some strong flavors! 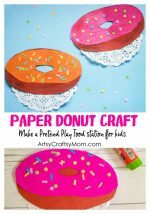 Cut out onion rings from white textured paper and add details with a pink or purple marker. 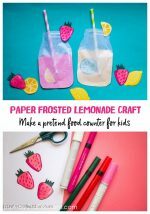 Cut out little pieces of yellow textured paper to look like cut pineapple. Add tiny ridges to make them realistic. 4. Make this pizza heartier with more ingredients! Cut out semi circles from red paper for tomato slices. From the brown paper, cut out little circles for pepperoni and mushroom shapes for, well, mushrooms! Add little details with colored markers. 5. Round up the toppings with little black rings for olives. You can either use ready made black stickers, or make your own with plain black craft paper and a craft punch. Go for slightly glossy paper for luscious-looking olives! 6. And what is the one thing a pizza totally, absolutely, definitely needs?? Cheese!! We’ve gone with two kinds of cheese for our pizza, using white and yellow crepe paper cut into thin strips. 7. Wow, that is a lot of ingredients!! Let’s start topping our pizza slice with cheese, followed by the vegetables, pepperoni and finally the olives. 8. Make more slices the same way – enough for an entire pizza! Boy, don’t they look yummy!! 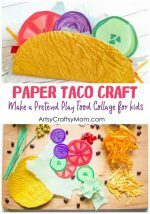 This paper pizza craft gives kids so many learning opportunities. 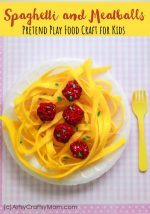 They can learn about different food groups – fruits, vegetables, dairy, grains and meat. It’s also a good exercise for cutting shapes – triangles, circles, semi circles, rings. Then there are flavors – sweet, sour, spicy, tangy. 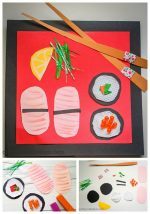 Older kids can also see how cut vegetables look different from whole ones, and how to detail each ingredient. Of course, they’ll be learning all this without realizing it – because of all the fun they’re having!